I was working on the Chantilly Chocolat when I decided to experiment with something new. Inspired from many of the cookbooks I have, I decided to do a mousse-type cake combined with a soft fluffy sponge and a tangy mango topping. So with some experimentation, I present to you my Mango Temptation! This cake is so much fun to bake and of course, being the mango addict I am, how am I to pass up on a lovely cake like this? This takes about 2 hours to bake and assemble, excluding time for the mango topping to set towards the end. I'd rate it a difficulty level 3 out of 5. Here's a tutorial on how you can line your baking tin. Pour into baking tin and lightly drop from a low height to release some of the larger air bubbles in the batter. Bake for about 25 - 35 minutes or till' toothpick comes out clean when inserted into the middle of the cake. Blend the fresh mangoes. You may choose to use store-bought mango puree but the real deal is really the best. Always love a fresh bowl of mango puree! To the water, add the gelatin powder. 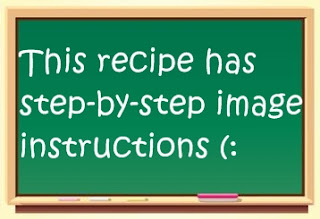 You may double boil it till it is all dissolved. Alternatively, heat it up in the microwave oven on medium heat in 20 second intervals till' mixture is all dissolved. You should get a mixture like this. Allow it to cool down while you whip up the whipping cream. To the whipping cream, add the mango puree and the gelatin mixture. Trim off the upper layer of the cake as this layer tends to make the cake dry. Arrange the square moulds/cake rings on top of the cake. 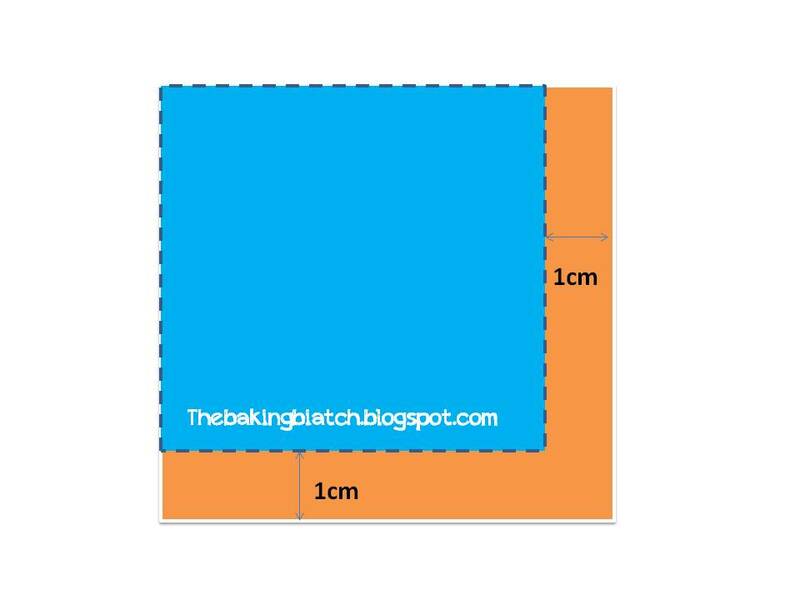 The cake size bakes 4 perfect square. Using a small knife, gently gauge the lines where the cake rings/moulds are and cut the cake to fit the mould. Cube up the mango into really tiny cubes. This is how small your cubes should be in comparison to the white teaspoon. *NOTE: The following steps are for a round cake but the steps are exactly the same for the square cake. The blue part is the portion that we will be using. You may nibble the parts cut out or keep them for cake pops! You should have some space like this at the side of your cake. Spray a small even amount of the sugar solution on the cake. Pipe some mango mousse that you have prepared into the space beside the cake. Then, pipe some on top of the cake. Scoop some mango cubes onto the space on top of the cake. Pipe some mango mousse next to it like a barrier. Top with some more mousse. Place the second layer of cake onto the mousse and press down. Spray a small even amount of sugar solution on the cake. Pipe an even layer of whipping cream on top of the cake. Smooth it out with a teaspoon. Leave in fridge to chill for 15 minutes. Leave at least 1/2cm of space from the top for your mango topping. In a bowl, add the water, agar agar powder and gelatin into the water. Heat up mixture in the microwave oven on medium heat for 2 minutes using 30 second intervals or until agar agar powder and gelatin is dissolved, stirring it between intervals. Add the fresh mango puree and heat up for another 2 minutes using 30 second intervals. You should get a mixture like this. If you do not wish to use the microwave oven, you may double boil this. Pass the mixture through a fine sieve. You should get little mango remnants like this. This step is optional but I prefer to do this as the mango topping will be smoother. You should have a mixture like this! 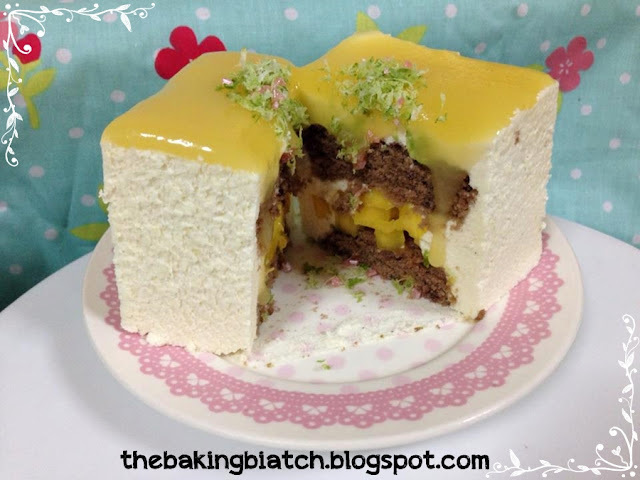 Clean up the sides of the cake ring/mould if there is mango mousse on it. Pour the mango topping onto the mango mousse and allow it to set in the fridge for 30 minutes to achieve the fluid-like texture I have in the image. Else, you may let it set for 2 hours to have a firmer top. Use the back of a small paring knife to run down the sides of the cake mould to remove the cake. Grate the laffa lime's peel to use as garnish. Top with some sprinkles. So, this cake maybe a little bit of a hassle but it's so pretty isnt it? Enjoy baking this for your loved ones! (: The combination of chocolate sponge cake and mango mousse topped with mango topping is simply divine!